This exhibition showcases examples of the author’s published works from the University of Delaware’s Library, Museums and Press’ Special Collections Department. He is the author of several books of poems, most recently Ozone Journal, which won the Pulitzer Prize. Other collections include June-tree: New and Selected Poems 1974-2000; Father Fisheye (1979); Sad Days of Light (1983); Reply From Wilderness Island (1988); Dyer's Thistle (1996); and several fine limited editions. Balakian’s memoir Black Dog of Fate is the winner of the PEN/Albrand Prize for memoir and a New York Times Notable Book Award. He also is the author of The Burning Tigris: The Armenian Genocide and America's Response, winner of the 2005 Raphael Lemkin Prize for the best book in English on the subject of genocide and human rights, which also was a New York Times Notable Book and New York Times and national best seller. His work, including essays on poetry, culture, art and social thought, has appeared widely in American magazines and journals and in anthologies. The exhibition was created in conjunction with the Pulitzer Prize-winning poet and author’s on-campus lecture at 5 p.m. on Thursday, October 12, in Gore Recital Hall of the Roselle Center for the Arts. 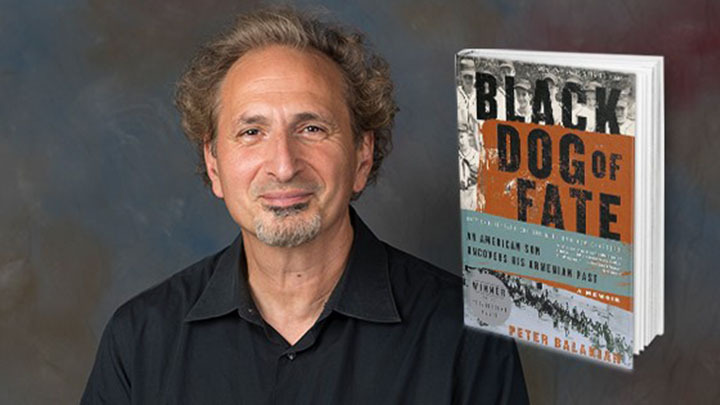 “An Evening with Peter Balakian” is free and open to the public. His talk will be followed by a reception and book signing until 7:30 p.m. in the Center for the Arts lobby.